From a historically low reading of 10 earlier in the year, volatility as measured by the CBOE’s VIX has all but tripled. On Friday it closed lower but intraday it reached a high of 29.84. That’s high both on a nominal basis and relative basis (see graph below). In the preceding two corrections, volatility only reached 20 something. 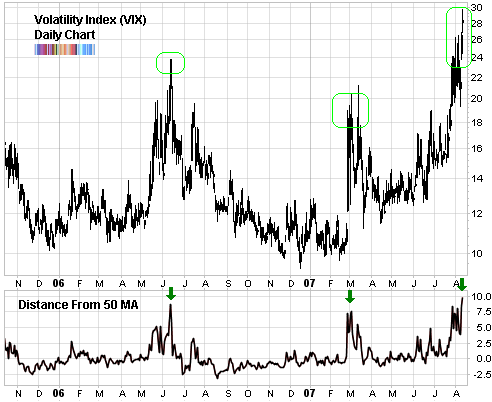 And relative to its 50 day moving average, volatility is now about as stretched as then. This is par for the course when we are operating with a correction thesis. Volatility spikes, the market gets spooked, smart money moves in (hopefully you) and the market resumes its merry way upwards. But a funny thing happened that is giving me concern about this recent volatility spike. Funny as in weird. Not ha-ha. A little over 3 years ago, the CFE started trading in VIX futures. This allowed people to go long/short “pure volatility” for the first time. So we now have a futures market in volatility itself. And we can analyse this market like any other futures market. Although we have limited history, what we see in market corrections is a move by the commercials to reduce their long positions in volatility and a concomitant move by the retail crowd (small speculators) to increase their long positions. A good example is last summer’s market action in June. So it is a bit disconcerting to now find the smart money commercial players in this market actually going more and more net long, even as the VIX has increased. And to kick things up another notch, the dumb money, small speculators are now extremely net short. Perhaps the commercials are hedging some of their gargantuan net long index futures positions? or perhaps some other wrinkle is in the works? One solace we can cling to is that the only other time when the commercials and small speculators were this long/short in the VIX market was in July 2006. Which worked out just fine as the market continued to recover and roar higher. Whatever it is, I’d still prefer to see the commitment of traders in the volatility futures market acting according to its past script. I don’t really get it. If the only point we have before with that kind of divergence between smart and stupid money and that was an incredible good buying opportunity, shouldn’t that indicate the same thing today? Johan, we’re seeing the opposite. The commercials are net long, not net short. the only other time [as today] when the commercials and small speculators were this long/short in the VIX market was in July 2006. Which worked out just fine as the market continued to recover and roar higher [which is when we want to be long]. Where did I read wrong or missunderstand? ah, yes, the thing is back then the VIX had already come down from its then recent high, while now it is stil up there. I didn’t write it very clear did I?